4x4s, part two | What Car? Times are tough for 4x4 makers. 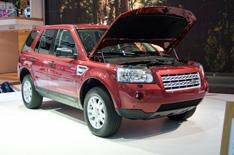 So, with Land Rover and Jaguar benefiting from a 700 million investment in green technology, this fuel-efficient Freelander arrives at just the right time. The Freelander TD4_e is the first vehicle to use Land Rovers stop-start system, which has made it the most fuel-efficient model in the companys 61-year history. Other green technology includes a gearchange warning light, a remapped ECU and low-rolling-resistance tyres. when the driver presses the clutch again to move off. The system will be fitted as standard to every manual diesel model (they account for 51% of sales), but the good news is the company has promised it wont mean a price rise. The end result is a reduction in CO2 emissions of 8% compared to the outgoing manual diesel. That equates to 15g/km less, which in turn means a 55 annual saving under the revised road tax charges due next year. Fuel consumption is also reported to be up to 20% better if youre plugging through traffic, while the combined cycle figure improves from 37.6 to 41.5mpg. However, all the additional stopping and starting will take its toll on other parts of the car, so Land Rover has upgraded components such as the starter motor to cope with the extra wear and tear. Theres also an auxiliary pump to keep the air-conditioning working when the engine is off, so occupants dont get hot and bothered while waiting in traffic. Lexus is taking a landmark decision with the forthcoming new RX. Since powerful petrol 4x4s are about as popular with UK buyers as worm sandwiches, and since Lexus doesnt have a diesel for the RX, the new 4x4 will only come in hybrid flavour. Its likely the GS450hs 3.5-litre V6 petrol-based system will be adopted. Lexuss hybrid know-how is growing all the time, so expect all performance figures to improve, including the present cars 35.8mpg on the combined cycle and 185g/km of CO2 emissions. Early indications are that there wont be any radical styling changes for the next-generation RX, which will likely have evolutionary looks. Skoda will have to expect a raft of new gags at its expense if it sticks with plans to name its baby 4x4 after the Abominable Snowman. However, Skoda has reason to be confident in its new product, which plucks its four-wheel-drive system from the Volkswagen Tiguan and uses parts from other VW Group vehicles, including Audi and Seat, to cut costs. This isnt just a rebadged VW Group car, though. The Yeti is a small 4x4 created in-house by Skoda to take on the likes of the Suzuki Jimny and Nissan Qashqai. As a result, buyers are likely to be offered several small-capacity engines that take advantage of the Yetis low weight to offer comparatively good fuel economy. Not content with one 4x4, Saab is launching two in the coming year: the 9-3X and 9-4X. The 9-3X will be based on the 9-3 saloon to create a small 4x4 for todays greener world. It will have four-wheel drive, lifted and tweaked suspension, and beefed-up looks. The 9-4X is a compact off-roader which will take on the likes of the Land Rover Freelander and Honda CR-V. It comes with the promise of respectable off-road ability, thanks to Saabs XWD four-wheel-drive system. Engines are expected to include a 300bhp 2.8-litre V6 petrol and 250bhp 2.9 V6 diesel, as well as turbocharged 2.0 petrol and 1.9-litre turbodiesel units. Despite the green lobbys best efforts, the 4x4 is here to stay although its getting smaller. The Urban Cruiser is a baby 4x4 based on the Toyota Ist and Scion XD, which have sold well in Japan and the USA respectively. With the emphasis on making 4x4s socially responsible, the range is expected to feature 98bhp 1.3-litre petrol and 88bhp 1.4 diesel engines mated to a front-wheel-drive version of the car. The diesel will also power a four-wheel-drive model. CO2 emissions are expected to be between 120 and 133g/km. That means the lowest-emitting two-wheel-drive diesel version will attract a road tax rate of just 30 a year, rising to 110 a year for the four-wheel-drive car. Baby 4x4 based on VW Tiguan underpinnings, but more luxurious and highly specced. All-new underpinnings, plus better-quality interior and much more flexible cabin. Twin-clutch gearboxes can be very efficient and provide smooth, fast shifts. Focus is on reducing emissions, but with some minor interior and exterior changes.